A glorious, cool 54 degrees this morning after the cold front passed! The long shadows of September mornings that reach over most of the fields, even mid-morning, this time of year makes us aware that the season is really changing. While our focus is on planting and cultivating the cool season crops we are keeping a very close eye on Hurricane Irma and where she might go. None of the scenarios being considered are good news short of an abrupt turn out to sea. We are certainly preparing for a good amount of rain and at least winds in the 20 mph range on Monday and Tuesday but ready to batten down more if it changes. We already uncovered the tomato Big Tops and will at least uncover half of the other set of Big Tops, partly it is that time of year and the rest is just in case. Otherwise we are into one of the best parts of the year with great working conditions in the high clear light and pleasant temperatures. 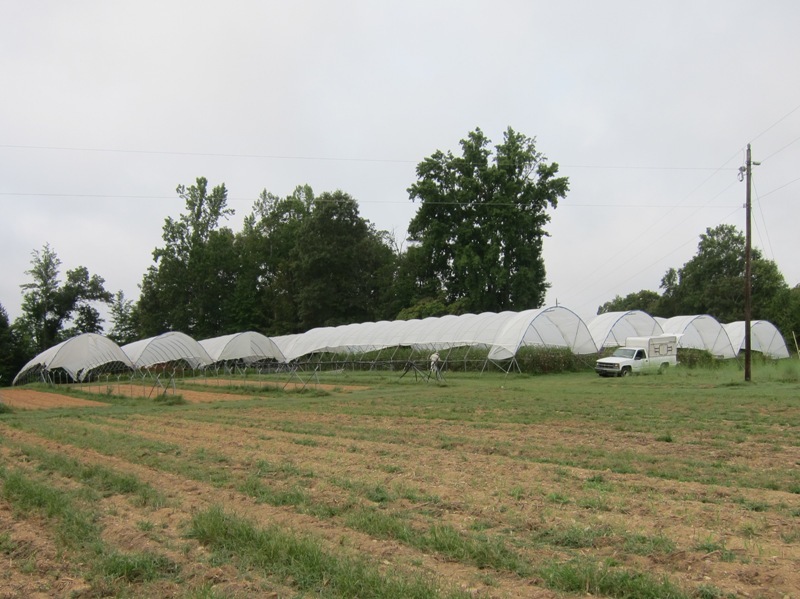 The little tunnels are completing their turn over from summer crops to cool season planting. The big planting of tomatoes will be pulled out over the next week too. Soil samples have been taken so that the end of the month we can begin all of the winter soil and cover crop work. It all starts to run fast now, have to enjoy it while we can. Newsletter a day late again, this is one of those weeks where it is all running fast and the early week uncertainty of the hurricane Irene’s track just adds to the level of complexity. We are always aware and on alert for these late summer hurricanes because if we are really going to get significant wind and rain then we have to take action days in advance. The biggest potential job is uncovering all the greenhouses which is best done in calm winds and dry conditions if we want to reuse the plastic after the storm. Sure we could go out heroically and cut the plastic off and let it fly, while maybe exciting and will save the metal frame, it is not the most ideal scenario. Our threshold is about 60 mph winds. Up to that and all of our structures can handle it, the Big Tops are the ones we worry about the most and it can take half a day just to uncover those. We have had to do it once before Charlie in 2004 and then ended up not getting any winds even though the forecast potential was for 60 -70 mph winds. In 2003, before the Big Tops, we uncovered the smaller sliding tunnels before Isabel when we did get slammed by 60 mph winds. The little tunnels were just fine but we did loose part of a shed roof. Of course all of this is colored by the memories of Fran but that was before we had any tunnel structures, thankfully! With the move of Irene further to the east our concern now is whatever rain we might get so the focus has been to make sure we get critical things harvested before any potential downpours and flooding. The winter squash is in the bottom field and ready for harvest. Nice and dry now and easy to collect, not so after a big storm so the last two days have been partly occupied by bringing in the 2000 plus pounds. This afternoon and tomorrow will be the usual major pepper picking even if Saturday could be a rain out. All of this in the middle of a ten day period which includes four tour groups including 40 Burmese refugees, teaching two classes, two dinners for various groups we are involved with, conference calls and a board meeting. Can’t wait for September to get here! Betsy says if that was a vacation then don’t ask her to go again! Mostly due to the potential of the incoming storms we worked our tails off! Normally on August break we do a little farm work and then take it easy but between crops that had to be harvested and battening down the hatches we only really felt like we had one slack day. Oh well only six weeks to go until the Big break. Until Hurricane Fran in 1996 we didn’t even think about big storms. It’s the wind that really has us jumping, with all of these greenhouses that are like big sails we have to be conservative when it comes to the forecasts for wind. Now every two years or so we have a fire drill taking plastic off greenhouses and tying down all of the equipment that normally is just strewn around the farm like five gallon buckets and other light items. This time the wind didn’t come but as you all know, as of early Saturday morning they were calling for up to 60 miles per hour winds. Our “Big Tops” are supposed to take up to 70 mph but who wants to try it? So we uncovered them knowing that the rain would then do such damage to the crops under them (the tomatoes for sure) that we would have a loss there. This is not a drive the car into the garage kind of job, it takes hours and it can’t be windy so we have to make these calls a day or more in advance. So we spent the better parts of Thursday and Friday securing things and then parts of Saturday and Sunday untying things. Now believe me we are glad the storms did not come but it sure didn’t make for a relaxing break! Other exciting news is that we are headed to Turin, Italy in late October for a first ever international small farmer congress being put on by the Slow Food organization. We are honored to have been nominated by the local Slow Food group and then to have been accepted to attend along with 500 other producers from the US and a total of 5000 worldwide! Slow Food is a group that originated in Italy, about 20 years ago, which is dedicated to the preservation and enjoyment of local, handcrafted foods like you find at market. Every two years they have a huge exposition in Turin displaying and tasting artisanal foods from around the world called the Salone de Gusto. For the first time ever they are overlapping that event with this congress of small producers called Terra Madre where we will participate in workshops and discussions on sustainable ways of producing great foods. Incredibly they are paying for all of our expenses except for our plane tickets! We have asked that they pay for half of our airfare so the local group is having a fund raiser next Wednesday the 25th at Pop’s restaurant in Durham. We are excited about the possibilities of this trip and hope that we come back with lots of new ideas, maybe the next pepper roaster or something equally fabulous. We will have more details in future newsletters. 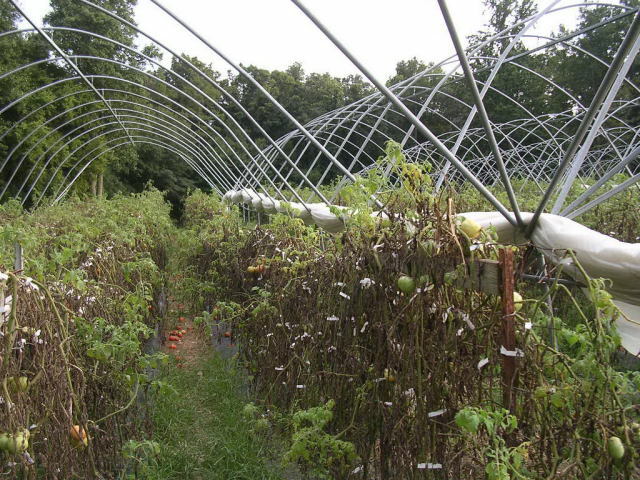 Tomatoes, now uncovered, succumbing to foliar disease from too much damp weather.